So, let’s start with you, Alex. You, of course, reached the final with Cardiff Met last year and first of all, just how big of an achievement is getting to the Twickenham final itself because BUCS Super Rugby is becoming increasingly competitive? Dombrandt: I think it was very tough in my year when we got to the final with teams beating everyone, but I think this year from what I have seen, it has only got even more competitive. The semi-final against Bath couldn’t have gone much better for us last year. It was a great win and afterwards, the realisation that you are going to get to play at Twickenham obviously sinks in. You’ve got all of your family and friends excited to come down and watch and you’re looking forward to a great occasion. And for Hartpury back in 2017, Seb, how tough was it getting to the final? Negri: We have all seen how competitive BUCS Super Rugby has become and when it comes down to knockout rugby and finals footy, it is always going to be difficult. Credit to the whole Hartpury system and the coaches and all the players in getting to another final. It is not an easy thing to do. It feels like yesterday that I was involved in the Hartpury team! I am really proud as an old boy to see them there again. Seb, when did you and your team really start focusing on the final? Would you say it's the week before, immediately after the semi-final win or even before that? Negri: It is important to take one game at a time. I remember when we won the BUCS league, straight after that, the focus was on the next job. Enjoy that night and enjoy the celebrations, but we all had our eyes on making Twickenham because at the end of the day, that’s where everyone wants to be. That was the goal and ambition. 'It was the perfect deal for me"
Dombrandt: The week leading up to it for us. Afterwards, it was important to understand that we had a final coming up, but it was important for us to also enjoy the semi-final win. Go out and enjoy it with your mates because these games don’t come around often. Once that night was done, the Thursday/Friday was definitely looking ahead to Hartpury and training in preparation for that. Did you guys change anything in your training because it was the final? Dombrandt: It was very much focus on ourselves. Obviously, a few tactical plans were there for Hartpury last year, but it was mainly train on ourselves. At the end of the day, what we did during the season got us into the final so it was very important to stick to what we had been doing all season. Negri: When you get to the final, there is not much you can train. In any big game, whether its playing in a final at Twickenham or playing in a Six Nations game, it is all about mentality and making sure you’re mentally ready for the challenge. There is a lot of build up and I think as a player, you just have to enjoy that and embrace it. That was the message when I was captain. Keep your feet on the ground. We had one foot in the door, but the job wasn’t done yet and as much as it is a fantastic occasion, it’s one thing making the final, but it is another thing winning it. So, we get to the day of the match. Did you travel to Twickenham on the day in 2017 Seb and the same for you last year Alex? Negri: We travelled up on the day. We checked into the hotel just outside Twickenham and had a feed. I actually remember getting quite emotional. My time at Hartpury was coming to an end and what a pinnacle it was to finish at Twickenham. It is one thing playing in the final, but it is another winning with your best friends. That is the message I always say and always said at Hartpury. Dombrandt: We travelled on the day of the game and stopped off at London Welsh for a pre-match meal and a walkthrough. It was an early start for us coming from Cardiff! As the day grew on, it was only natural for the excitement to build and I think when we got to London Welsh, that’s when you realise that when you get back on that coach, you’ll be arriving at Twickenham. Any memories of stepping out at Twickenham? Dombrandt: I remember the warm-up aspect quite clearly. The women’s game ran into extra-time and it was all quite hectic! We were waiting in the changing room and when we went out, I don’t even think we did our full warm-up. I remember it was very rushed because of the timings! Negri: It was really special. As soon as you get off the bus, you see fellow Hartpury students shouting your name and singing your song. The support was amazing. You get into Twickenham and you’re just like wow! You’re in the stadium and people talk about Twickenham being the ‘Home of Rugby’ so as soon as you enter those gates, you get goosebumps. It is important for all the players to just take it all in. Those opportunities don’t come around alot so just enjoy the occasion. Both of you captained your teams at Twickenham. How special was that whole experience? Dombrandt: I remember it well. The injuries of Tom Morgan and Aled [Evans] meant that I was captain. To lead the boys out was a huge honour. It something I won’t forget, for sure. The saying of a 'game of two halves' was very much the story of our game! I think first half, we were nowhere near our best and Hartpury were good and capitalised on our errors. In the second half, it was just about realising, for some of us, this would be our last game for Met and it was about just trying to throw everything at them. Luckily, we came back but unfortunately we were pipped at the post and it was quite gutting. It was tough to take for sure, especially with it being the last game for some of us. Negri: I don’t just say this, but it is one of my best rugby memories – right up there with my Benetton debut, my Italy debut and my Six Nations debut. These are all special occasions, but playing and winning with your best friends at Twickenham was amazing. It was a special day leading up to the game and also the way we won was great and the after-match celebrations were awesome. I got injured in the second-half, but that didn’t stop the beers flowing! I don’t really remember much from most of the game actually. I do remember getting knocked out and waking up in the stadium and I was like ‘Barnesy [John Barnes], let me go back on? !’ He was like absolutely not because I had just woken up! Good memories all round! You both have played at Twickenham since your respective BUCS matches. 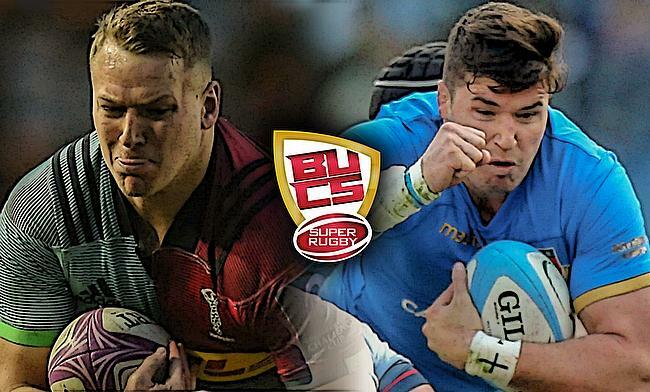 How would you sum up playing in a BUCS Super Rugby final? Negri: It is a dream come true for any student and for anyone who is studying and playing rugby, that is the real goal. For me at that time, it was a dream to play in a stadium like that. It is exciting and I think you just have to go out there and play as if it was your last ever game. That’s how I look at it. I just wanted to give everything and play that final as if it was my last ever chance to play rugby in my life! Dombrandt: It was massive to have that opportunity at university level to play at one of the biggest stadiums in the world. If you can’t get up for it, then you probably shouldn’t be playing the sport. Leeds Beckett and Hartpury should be very excited for the prospect of playing there. You need to try and take it with both hands and leave no regrets on the pitch. Sebastian and Alex were speaking to TRU’s Chris Heal. Make sure you follow us across social media and online over the next couple of days as we’ll be live from Twickenham for this year’s final.